There was a ton of back-and-forth when it was revealed that J.J. Abrams' Star Trek sequel would be called Star Trek Into Darkness, with the cynical fans hating on it, while others focused on the darker (literally) direction the series seemed to be heading in. 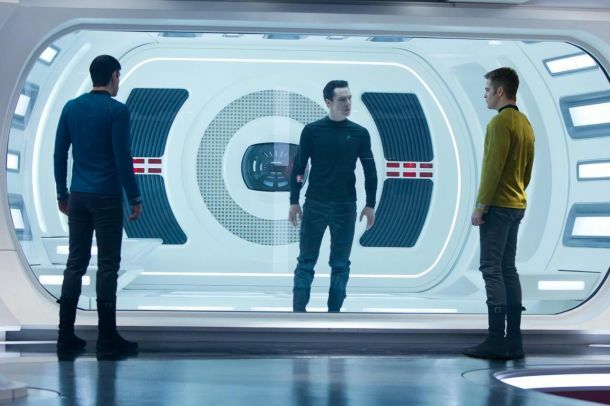 What fans may not realize, though, is that there are usually lists full of titles for a movie this big -- and when it comes to alternate titles for Star Trek Into Darkness, J.J. Abrams recently revealed to MTV one that almost happened: Star Trek: Vengeance. "There's an intimidating giant black ship in this thing called the 'USS Vengeance.' We talked about that word, vengeance," Abrams said, though they eventually dropped it because they felt it's a word that's used too often in movies. Die Hard with a Vengeance, Ghost Rider: Spirit of Vengeance and Furry Vengeance are all examples of popular titles that used the word. Here's Abrams on the alternate title. Do you think it would've sold you on the movie more if it was titled Star Trek: Vengeance?